Hey guys! 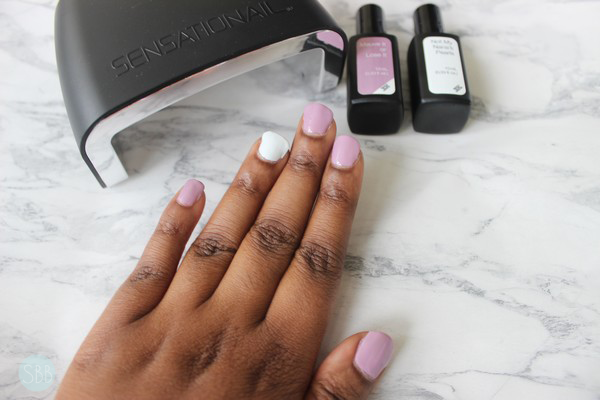 Today I have an exciting post on a Gel Nail Polish system by *Sensationail. I have always wanted to try a at home gel polish system and I has super excited when I received this item, I just couldn't wait to try this out. 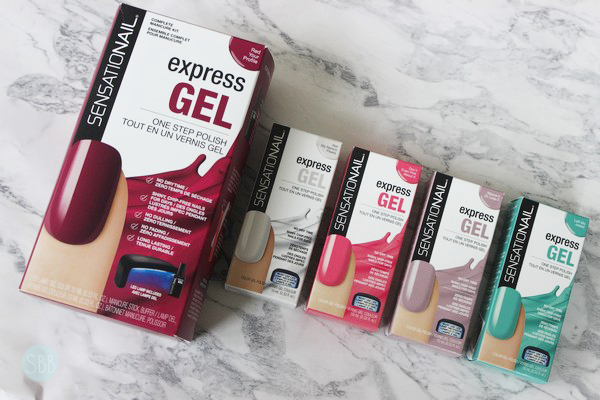 In this system from Sensationail you get in your Express Gel Kit 1 nail polish, a LED lamp, manicure tools and an instruction sheet. 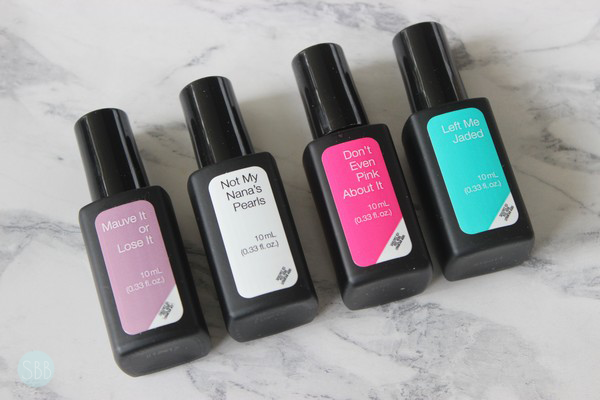 I was also lucky enough to receive 4 gel polishes to try. The names are so cute when I pulled them out of the bag and read the names each name as I read it I kept saying these are so cute. Sensational nails has more colours online I saw a few that I would want to give a try. The nudes look amazing I really want to try Vanilla Chai and Pink Sand. In addition to having a wide selection of shades they also have different finishes. For me I found this system super easy to use and I didn't have any trouble at all the instruction sheet was very helpful and easy to understand. I love the LED lamp it's super easy to use. My fave part about this, is that it turns off automatically and can sense when your hand is under to turn on, as well it wont make the surface that you place this lamp on hot. With this gel system all you need is your gel polish and that is it! No base code and no top coat. You can however apply a base coat if you like. I tried this without a base coat to test this out. However I love using a base coat so next time I will. Once polish is applied you place your hands under the LED lamp for 30 seconds. I used two coats of polish as recommend in the instructions, in between each coat I placed my hands in the lamp. When I placed my hand user the lamp and took them out I was surprise at how shiny and fast my nails where dry. I didn't even believe that my nails where dry I even poked my nail hard to double check lol. But they where dry! With this system I was so surprised at how easy and quick I was able to do my nails. I have never done my nails in such a small amount of time. This took me less this 30 minutes including the time it took me to cut and file my nails. Overall I really love this systems and I have fallen in love. I used to do my nails all the time and over the past 2 years I hardly ever do them any more. But now I have rediscovered what I loved about doing my nails. For more please check out Sensationail website! I will also have another review coming up soon on there gel polish transformer kit! What do you think about at home gel kits? Ah I've just received this and you've got me so excited to try it. Sounds amazing! I bought this 2 years ago and thanks this I actually started to do my own gel nails. I'm very thankful to this products.